Paul H. Nitze, adviser to presidents of the United States from both parties, a leading strategist and arms control expert, and co-founder of Johns Hopkins' School of Advanced International Studies, died on the evening of Oct. 19 at his home in Georgetown. He was 97. Just a week earlier at the celebration of SAIS' 60th anniversary, Secretary of State Colin Powell paid tribute to Ambassador Nitze, his friend and colleague of many years. Secretary Powell said then that Paul Nitze was an "icon" to those in the State Department. Going to a meeting with Paul, he said, "was like having Moses at the table." Unable to attend the celebration, Nitze sent word to Powell that, of all the things he did in a career that lasted nearly half a century, he considered the founding of SAIS to be his greatest accomplishment. In an interview with The Gazette in 2002, Nitze said, "I have a sense that the school, and to some extent I, did well — that we added to the strength of the Washington intellectual establishment." Nitze founded the School of Advanced International Studies in 1943 along with Christian Herter and other leading statesmen. In 1989 the school, which became a division of Johns Hopkins in 1950, was renamed in his honor to recognize his distinguished private and public career and exceptional service to SAIS and the university for five decades. "SAIS has suffered a profound loss with the death of Paul Nitze," said Jessica P. Einhorn, dean of SAIS. "In founding this school with Christian Herter, he implemented a special vision. Paul knew that in the wake of World War II, the country would need future leaders and diplomats who understood international relations not just from an American viewpoint but also from a worldwide context. His legacy will live on through the more than 11,000 graduates of the school who are a testament to his wisdom and his foresight." JHU President William R. Brody said, "The entire nation owes a debt of gratitude to Paul Nitze, but we at Johns Hopkins are particularly saddened by his death. As co-founder of SAIS more than 60 years ago, he demonstrated in a private undertaking the wisdom and vision that was so much a part of his public life. The university relied over the years on his leadership and advice, and we are very much the better for it." After graduation from Harvard University and a decade as an investment banker at Dillon, Read & Company and P.H. Nitze & Company, Nitze joined the U.S. government in 1940 and advised every president from Franklin Roosevelt to Ronald Reagan, with the exception of Jimmy Carter. In 1950, while at the State Department, Nitze was responsible for the formulation of NSC 68, the document that provided the framework for the Cold War between the United States and the Soviet Union. He also served as director of the Department of State Policy Planning Staff, secretary of the Navy, deputy secretary of defense and member of the U.S. delegation to the Strategic Arms Limitations Talks from 1969 to 1974. In 1962, he was a member of the group of top officials who met daily with President Kennedy to advise him during the Cuban Missile Crisis. As head of the U.S. negotiating team at the Arms Control Talks in Geneva from 1981 to 1984, Nitze took his now famous "walk in the woods" with Soviet negotiator Yuli Kvitsinsky in an effort to break the deadlock between the super powers on Euromissiles. From 1984 to 1989, he was ambassador-at-large and special adviser to the president and secretary of state on arms control matters, playing a crucial role in negotiating the Immediate-Range Nuclear Force and strategic arms treaties. Nitze's public life was chronicled in several books, including Strobe Talbott's 1988 The Master of the Game and David Callahan's 1990 Dangerous Capabilities: Paul Nitze and the Cold War. Nitze published his memoirs, From Hiroshima to Glasnost: At the Center of Decision, in 1989. In 1985, President Reagan awarded Nitze the Presidential Medal of Freedom, the highest civilian honor in the United States. On Jan. 10, 2001, the U.S. Navy named the 44th ship of the Arleigh Burke class of guided missile destroyers in honor of Nitze. The USS NITZE, currently under construction, is scheduled to be commissioned in March. Nitze's devotion to the nation was rivaled only by his commitment to SAIS. In launching the school in 1943, he and Herter convinced business friends to fund the fledgling institution. 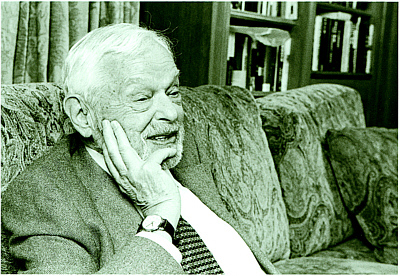 Eleven years later, while working and teaching at SAIS, he succeeded Herter as chairman as the SAIS Advisory Council, a position that only he or Herter held until 1981. In 1957, Nitze conceived the idea of a SAIS-related think tank — now the Johns Hopkins Foreign Policy Institute — to involve the school more directly in the discussion of U.S. foreign policy issues. Three years later he was instrumental in helping then JHU President Milton Eisenhower raise $4.2 million for the SAIS building at 1740 Massachusetts Ave. in northwest Washington, D.C. The building was named for Nitze and his wife, the late Phyllis Pratt Nitze, in 1986. In 1980, he helped establish the Security Studies program at the Foreign Policy Institute and co-taught a course on security issues there. When SAIS had outgrown its building in 1988, Nitze offered to match any amount raised by SAIS up to $5 million to expand the school. The challenge was successfully met in 1989, doubling the school's physical plant with the addition of the Rome Building at 1619 Massachusetts Ave., N.W. Nitze retired from the U.S. government in 1989 and spent his remaining years at SAIS, teaching, writing and pursuing his lifetime interest in strategic and national security studies. He is survived by his wife, Leezee Porter; four children, Heidi, Peter, William and Phyllis Anina Nitze Moriarty, from his previous marriage to Phyllis Pratt Nitze; a stepdaughter, Erin Porter; 11 grandchildren; three step-grandchildren; and seven great-grandchildren. In a broadcast e-mail sent Wednesday to the Johns Hopkins community, President Brody concluded by saying that he wanted to convey to Nitze's family "our deepest admiration for a statesman, a visionary, a colleague, and a dear friend of the university. It is hard to imagine," he wrote, "a life more nobly lived than was his." A funeral service was planned for Saturday at the National Cathedral in Washington, followed by a private burial.